"Freda Ward" redirects here. For information on the murder victim, see Alice Mitchell. 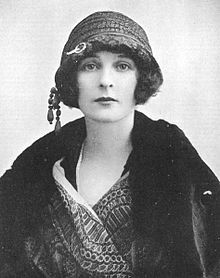 Winifred May, Marquesa de Casa Maury (née Birkin; 28 July 1894 – 16 March 1983), universally known by her first married name as Freda Dudley Ward, was an English socialite best known for being a married paramour of the Prince of Wales, who later became King Edward VIII. Born Winifred 'Freda' May Birkin, she was the second child and eldest of three daughters of British Colonel Charles Wilfred Birkin (fourth son of a lace embroidery and tableware magnate of Nottingham, Sir Thomas Birkin, 1st Baronet) and his American wife, Claire Lloyd Birkin (née Howe). Freda was the mistress of the Prince of Wales from 1918 to 1934, when he fell in love with Wallis Simpson. The relationship between the Prince of Wales and the married Ward was common knowledge in aristocratic circles. Winston Churchill observed in 1927, after travelling with them on a train, "It is quite pathetic to see the Prince and Freda. His love is so obvious and undisguisable." 9 July 1913 to Rt. Hon. William Dudley Ward, Liberal MP for Southampton. They had two daughters. Her first husband's family surname was Ward, but 'Dudley Ward' became their official surname through common usage. Their divorce took place on the ground of adultery in 1931. 20 October 1937 to Pedro Jose Isidro Manuel Ricardo Mones, Marques de Casa Maury. From 1938 the couple took up residence in St Johns Wood, London, at 58 Hamilton Terrace, which they commissioned from the architects Burnet, Tait & Lorne. They divorced in 1954. Penelope Ann Rachel Dudley Ward (1914–1982), the actress Penelope Dudley-Ward, later Lady Reed, known as Pempie, who married firstly in 1939 (divorced 1944) Anthony Pelissier, by whom she had a daughter, and secondly in 1948 film director Sir Carol Reed, by whom she had a son shown below. Tracy Reed (1942–2012, b. Clare Pelissier), actress; first wife of actor Edward Fox, who later played Edward VIII in Edward & Mrs. Simpson in which their affair is depicted; they had one daughter. Joseph William Peter Laycock (Joe Laycock) (1938–1980) was married to actress Lucy Fleming, niece of the writer Ian Fleming, the creator of James Bond; and had issue. A portrait of her by the artist John Singer Sargent was discovered on the television series Antiques Roadshow in 2016. ^ "Marquesa, 'First True Love' Of Edward VIII, Is Dead at 88". The New York Times. 18 March 1983. Retrieved 21 September 2015. ^ Morton, Andrew (2015). 17 Carnations: The Royals, the Nazis, and the Biggest Cover-Up in History (ePub ed.). Grand Central Publishing. p. 98. ^ Sebba, Anna. "17 Carnations by Andrew Morton (Review)". Chartwell Bulletin. Winston Churchill Centre. Retrieved 21 September 2015. ^ "House for Marques and Marquesa de Casa Maury". Dictionary of Scottish Architects. Retrieved 20 November 2008. ^ Information on death date from Lundy, Darryl. "The Peerage database". The Peerage. [unreliable source], retrieved 14 December 2007. ^ Lundy, Darryl. "Lady Clare Angela Louise Ward". The Peerage. [unreliable source], mistitled because she was Lady Laycock, but not Lady Clare Angela Louise Ward as daughter of an earl. Last edited 21 January 2006. ^ "A portrait by John Singer Sargent, RAF Coningsby 1, Series 38, Antiques Roadshow - BBC One". BBC. Retrieved 2 December 2017.